Markets by Jaya One or more popularly known as Markets 17, will be throwing a two-day celebration for all bazaar aficionados this 12 and 13 December 2015 to celebrates their 5th anniversary on the bazaar scene. 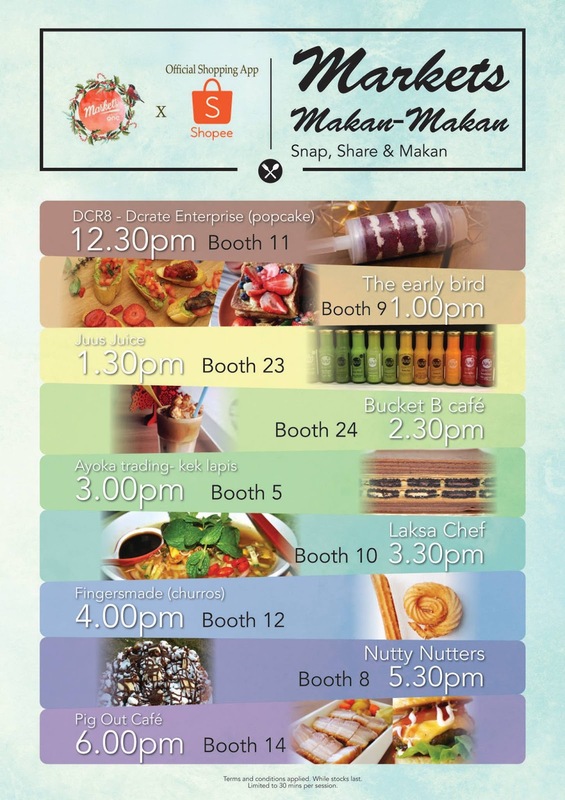 The much-anticipated quarterly bazaar will be held at the Square, Jaya One commencing from 11am until 7pm. This year theme will be Back to Memory Lane. Want to know more what's really exciting about this Markets 17? There will be over 100 vendor ranging from the latest fashion clothing, handcrafted goods, quirky paraphernalia, vintage decorative items as well as mouth-watering homemade food at the Markets. Which definitely make you shop till you drop for Christmas this year! Artisan vendors busy decorating their stalls to make it attractive and enticing. Not forget, Aspiring local artists wowing the crowd with their performance too during the market. You can enjoy shopping with music performance too. This year be sure to get ready to soak in the carnival-like atmosphere as Three Octaves, one of the finalists in the aforadio’s Undiscovered Finals 2015 Competition will be performing at Markets 17, amongst other performances by young aspiring artists. The amazing Kapten Buehbossa Giant Bubbles is all set to keep the crowd entertained with their giant bubble show. You can even have all these delectable homemade cupcakes for your loves one too! Any stationary lovers out there? You could search for many Handcrafted item, such as books, bags, stationary, art book and many more handcrafted item at Markets. Looking for some healthy and organic food? Markets 17 definitely be the best place for you because homemade food products are very much sought after at Markets. You can shop for many homemade food products which are really healthy and organic which are good choice for family home cook. There are many homemade products can be found in Markets too beside food products. 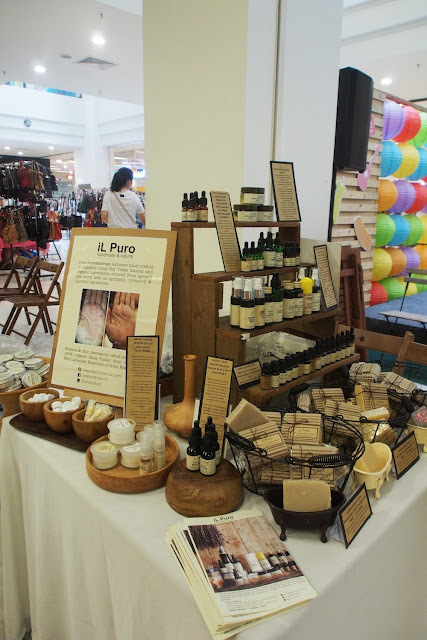 Such as Bath and Body Products, iL Puro consists of natural homemade bath and body products. And even Claire Organics too! This was always One of the crowd's favourites. Try to spot this booth when you visit Markets 17! You can reach there early too, as you can get to see more stuff and be the first crowds to get the best deals at Markets. Not only that, Christmas comes early for the first 800 bazaar enthusiasts as they will get to walk away with exclusive goodie bags consisting of a myriad of items when they register at the registration booth situated in front of the The Morning After café. If you haven't have your Christmas shopping yet, it's time to shopping and dressed in your best outfit while hunting for clothes and food at Markets, Jaya One Because fashion-savvy shoppers can take this opportunity to show off their eye-catching outfits in the Outfit-of-the-Day (OOTD) Contest to stand a chance to win surprise Christmas gift boxes from CubeCrate Malaysia. 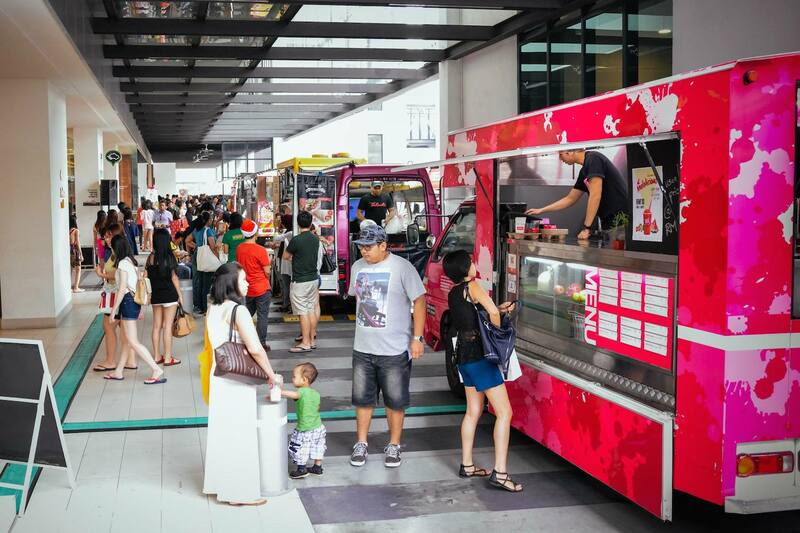 Food trucks are parked at the entrance of The School, Jaya One all day long. So you could easily spot FOOD when you are hungy! And On the 12 and 13th itself you can get FREE FOOD to eat just follow by simple steps and you are good to go. Foodies will not want to miss out on the free food giveaway sessions by selected food vendors running at different hours throughout the two days. Please click on the link (Here) For more Info. Not only that For those who want to enjoy a hassle-free shopping experience, there will be a RM8 off each ride to and from Jaya One during the two days with the promo code ‘GCMARKETS’ using the GrabCar mobile application. 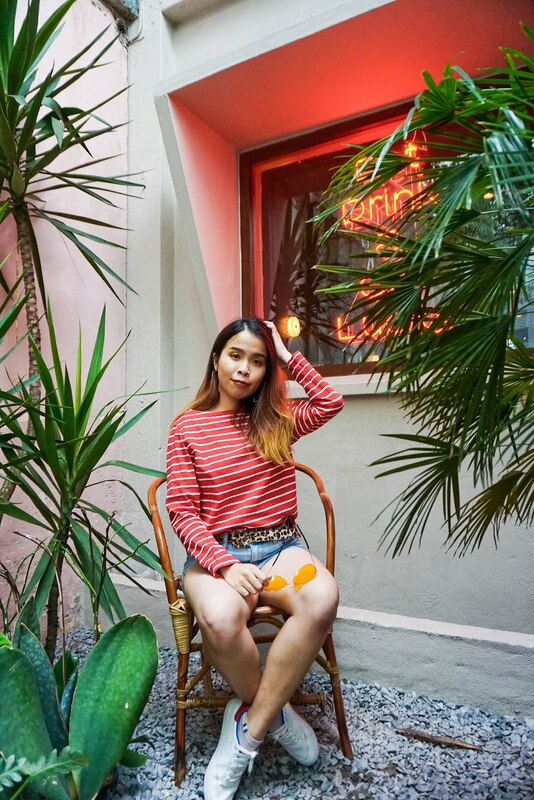 You can End the year of 2015 with a bang by immersing in a weekend filled with fun, entertainment, shopping, gastronomical delights and artsy vibes. For more information on Markets 17, visit the Facebook page at www.facebook.com/themrkts. Nestled in the bustling Section 13 district of Petaling Jaya, Jaya One is a commercial centre comprising of 3 entities – The School, POP by Jaya One and PJ Live Arts. Jaya One aspires to be an innovative community by bringing together budding entrepreneurs, arts enthusiasts and passionate educationists under one roof. It is a place that inspires new talent and encourages self-discovery via enrichment initiatives; giving the community a sense of purpose. The School is Malaysia’s first enrichment mall that emphasizes on child enrichment and learning. It is a family-friendly mall designed to encourage kids to play, learn and grow in a safe and stimulating environment. The School aims to change the perceptions of education by empowering both kids and parents with various enrichment initiatives to spur critical thinkers and thought-leading individuals. yesterday almost go there but decided to go home. shall find time to go Jaya One, I don't know go as need depend on waze. So fast and it's already the 5th year. How time flies. The homemade cupcake looks so nice! wah! so many things to buy lerh! always like jaya one as they act as community mall, offering much more than just normal shopping mall service. Free foods giveaway definitely make this more interesting. So food truckts here. Wanna grab some of the delicious food here. hope to be able to bump into you there babe! :D see youuuu! I've always wanted to check out the bazaar at Jaya One but still haven't got the opportunity yet. One of these days, I tell myself. Girls will shop like crazy (can eat while shopping)! But I have more interest on those stationary. Always love Markets! Will be there tomorrow! Oh, I did not know they have booth inside too. I thought all the booths were only outside. I also have a booth there (Plusify & I Can't Sew fashion boutique) and I personally recommend Moon-E Store. I bought tons of stuff there, every time I see their stall I have to buy something... too irresistible. so banyak orang! :) so many choices too, no wonder its so happening. I was at the Markets @ Jaya One on saturday. I bought a few accessories. wow!!! people mountain people sea!!! so many things to buy! !